Industrial strength construction helps transports heavy loads with ease. 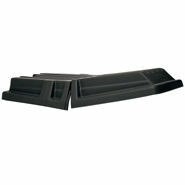 Domed hinged lid conceals loads without reducing capacity. Tilt truck lids can also help keep debris inside your truck ond out of your facility.